The funeral for Terrance “TK” Keaton will be held Wednesday, December 1, at New Jerusalem Full Gospel Baptist Church, 1035 E. Carpenter Rd. in Flint, starting at Noon. Keaton passed away last Monday in a car accident. He was a member of the St. Clair County Community College basketball team in Port Huron and beloved by many in the Flint area. Please take a moment to celebrate his life by writing in his guestbook. 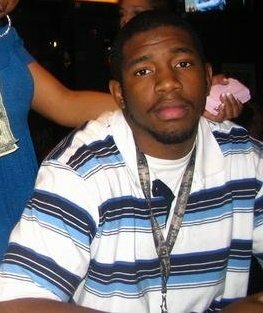 Terrance Keaton, 20, died on Monday in a car accident. He was a member of the St. Clair Community College basketball team that won the 2010 regional championship back in March and a friend to many in this basketball community. I might have actually coached you once or twice in all the time I’ve known you; even so, you always called me “coach”and I never corrected you. You were something special, Terrance. You didn’t need basketball to be a star. To know you was to love you. 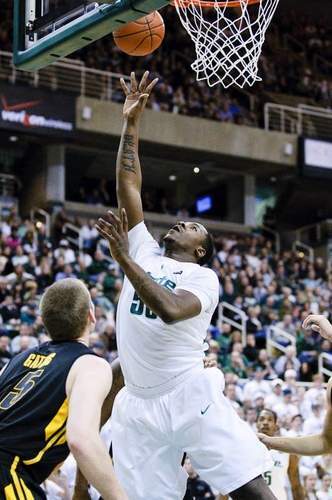 Will Michigan State’s Derrick Nix transfer? There’s a lot of speculation surrounding the decision of MSU coach Tom Izzo to leave sophomore center Derrick Nix at home during the Maui Invitational. Some, like LSJ beat man Joe Rexrode has even used that dreaded ‘t’ word: transfer. If, indeed, Nix is concerned about playing time and, ultimately, where he fits into this team (ranked in the top three in the nation in almost every publication), then transferring might be on the horizon. I’ve personally taken a lot of heat in the last two years because of my contention that Nix was the least-deserving Mr. Basketball Award winner in history and a bust-in-the-making for Izzo. Further, I pointed out that he, through his career, has been out of shape and utterly bereft of basketball skill. As a freshman at MSU, Nix played a little less than seven minutes per game and was not particularly productive even in his limited role — two points and two board per game. He shot 50% from the floor and about 27% from the line. LANSING, Michigan — The Stars, you could say, were aligned on Saturday afternoon. The Lansing Stars trailed almost the entire game against archrival and no. 2-ranked Mott Community College, ultimately winning in the final minute, 70-69. The alignment was all about effort up and down Lansing coach Mike Ingram’s roster. The Stars were ready and, despite cold shooting all afternoon, played harder and wanted it more than Mott. Effort and intensity on defense, ironically, has been the method of operation for Mott over the years. It seems, however, that these players are living off a reputation they don’t deserve. Detroit Country Day’s big man, 6-11 senior Amir Williams, has committed to Ohio State University. The Buckeyes are getting a very athletic and mobile post player in Williams who fits the Buckeyes’ system and has the potential to be an immediate impact player. Williams runs the floor extremely well and finishes above the rim with a clear path or from drop-off passes created by dribble penetration. He rebounds on both ends, can make open shots to about 15 feet and can face and drive to the basket from short distances, which will be perfect in Ohio State’s spread offensive attack that includes multiple set plays with a variety of ball screens and great spacing. Williams should get ample opportunities to be an impact player right away at tOSU as the Bucks’ freshman phenom Jared Sullinger will, undoubtedly, leave for the NBA (hopefully the Pistons). I’ve seen Williams on numerous occasions and, unlike some, have never been blown away with his ability. However, when compared to some of the other big men who have gone to high D-1 conferences in the last few years, he’s probably the best prospect. He’s nimble and athletic for a kid his size. He joins 6-9 center Trey McDonald (Battle Creek Central) in OSU’s recruiting class. Mott Community College housed Owens (Ohio) last night in Flint, 95-56, behind 23 points from sophomore guard Marshawn Norris. The Bears will begin preparation for Saturday’s showdown on the road versus archrival Lansing Community College. The Stars beat Kirtland last night and are also unbeaten heading into Saturday’s game. 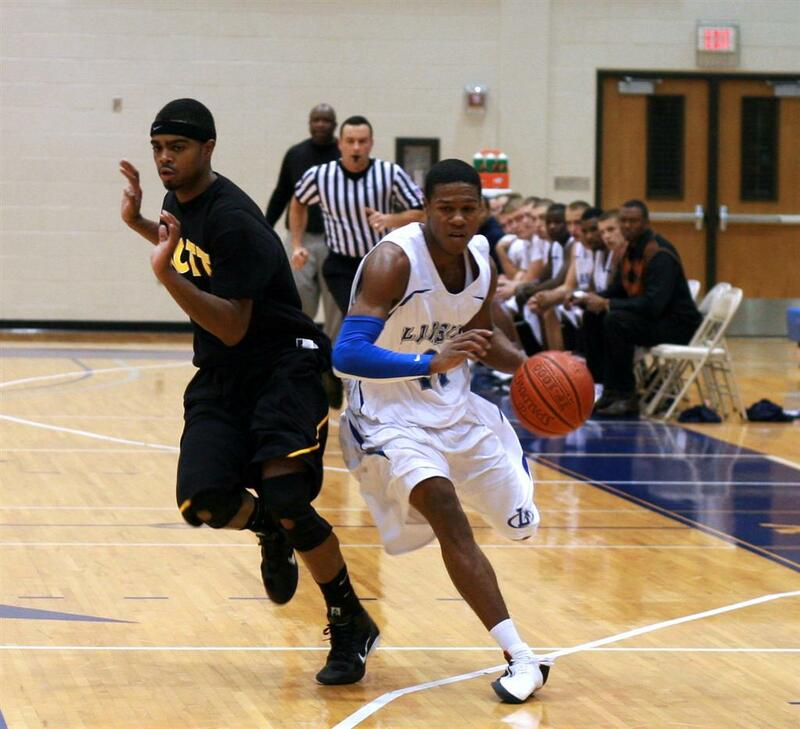 Ironically, Lansing’s leading scorer is former Flint Northern standout (and Iowa Central transfer) Michael Martin. Saturday’s game is scheduled for 3 p.m.
Henry Ford CC, Mott’s other rival, beat Jackson Community College last night. HFCC’s only loss of the season was to Lansing by double digits. First, the obvious: I may have been overly optimistic when I predicted the Pistons would nab the seventh seed in the Eastern Conference with 38 wins. I misinterpreted the close losses as signs of a competent team that just had to figure out how to hold a lead. Four wins in five games after the 0-5 start seemed to reaffirm my theory that the Pistons were going to put it together. I hadn’t counted on the schism in the locker room, Tayshaun Prince turning into a prima donna, and Jon Kuester not being able to stick to any semblance of a rotation. Portland: Close first half, terrible second half. Portland’s size in the paint was way, way too much for the Pistons. Some hot shooting and inspired play from Tracy McGrady kept the score respectable, but the Pistons had no answer for LaMarcus Aldridge. I really think that this was the game that sealed the Pistons’ fate: everyone realized that Austin Daye at power forward wouldn’t work anymore. Aldridge got whatever he wanted in the paint, and the Pistons had no answer. Clippers: Kuester started Daye at power forward again this game, and while Austin had a few points, he couldn’t slow down Blake Griffin (though, to be fair, not many people can). Jason Maxiell came in and did a respectable job down the stretch, coming up with a few key plays at the end of the game to help the Pistons preserve the win. Of course, Kuester overreacted to this by giving the start to Maxiell the next game and giving Daye a DNP-CD. Let me get this straight: a guy who was out of the rotation gets to start because of one good quarter, and the starter, who won the job in preseason, now doesn’t play at all. How does that make any sense? GLH’s pick for Michigan Mr. Basketball last season, Maurice Jones, looks like a stud just two games into his college career. On Monday night, the pint-sized freshman lit up Santa Clara for 29 points and five assists in the Trojans’ 86-73 win. And, much like his days at Arthur Hill, Jones never left the floor. Jones also had 13 points in the season opener versus UC-Irvine. Once Pookie was a senior, I agreed wholeheartedly. He’s just that good. We never should have let him get out of Michigan. Mott and Owens is always a battle. Henry Ford slipped up early in the season and now they have to contend with a much-improved Jackson squad that put a scare into Owens last week. Lansing is probably the sleeping giant in the state, with athleticism to spare. They take on Kirtland, a perennial pushover no more. They already have three wins on the season including against no. 5-ranked Grand Rapids. Kirtland’s most talented player, at least among the guys I’ve seen, has to be former Saginaw/Arthur Hill guard Jonathan Edwards. Get out and support JUCO basketball. Here’s a guy, Nate Cox, who went from being a pretty good high school player (just barely worthy of the title “standout”) to a great college player. Nathan Cox led Davenport University to two wins during the opening week of basketball season to be named the Wolverine-Hoosier Athletic Conference (WHAC) Men’s Basketball Player of the Week. A senior from Flushing, Mich., Cox averaged 22.5 points and 5 rebounds as 11th-ranked Davenport defeated Great Lakes Christian College (Mich.), 110-56, and Grace Bible College (Mich.), 74-70. He added two assists and two blocked shots on the week. The forward was named the Panther Tip-Off MVP after scoring 12 points during a 16-point run to help DU overcome a 56-42 deficit in the championship game against two-time defending NCCAA champions Grace Bible.